Ikan Corp has announced its line up for NAB, including their popular Piatto lights, ELE-ENG Shoulder Rig, Fly-X3-PLUS phone gimbal and the VX9i 8.9 inch monitor. All this and more can be seen at NAB 2015 in booth C6537. iKan’s Piatto line of lights make great accent lights that work particularly well for creating eyelight. They come in several sizes, including 6″ diameter (PL60), 9″ diameter (PL90), 7″ x 4″ (PL74), and a 10″ x 3″ (PL103), with different battery plate options for Canon, Panasonic and Sony batteries. The Piatto Lights have a readout on the back where you can see the color temperature and brightness level, which can be adjusted anywhere from 10% to 100%. The lights come with standard 1/4-20 mounts, and gel clips around the edge. The lights are all available now, and prices range from $249 to $379, with $249 for the PL74, $279 for the PL103, $279 for the PL60, and $379 for the PL90. 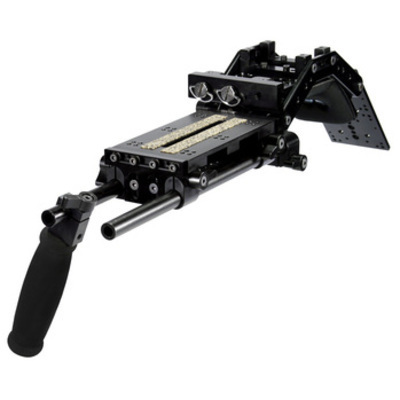 The newly released ELE-ENG is a detachable shoulder rig support system for the ENG and event videographer. With solid aluminum construction, it’s designed for quick assembly and quick camera mounting. A lightweight, portable shoulder rig solution that fits easily in your camera bag. It also features a reversible shoulder pad and snap lock system that makes for a no tool setup. The ELE-ENG starts at $249. 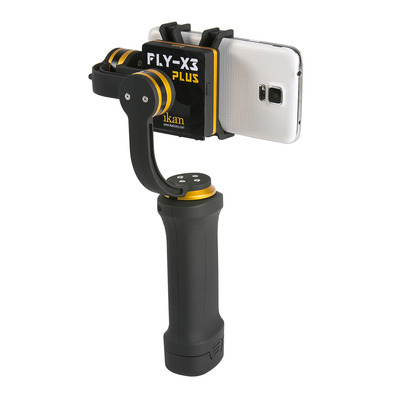 The FLY-X3-PLUS Gimbal Stabilizer from Ikan turns your mobile phone or GoPro camera into a powerful image capture tool, shooting fluid professional video and eliminating shaky camera moves. The unique 3-axis brushless motor gyro system uses sophisticated software to stabilize your smartphone or GoPro, and makes pans, tilts and even walking shots appear to “fly.” Complicated steady rigs are difficult to balance but the FLY-X3-PLUS is easy to set up and operate. Simply place your smartphone in the cradle with your lens to the left, then level the FLY-X3-PLUS and turn on. The motors will level within a few seconds, and you’re ready to shoot. The Fly-X3-PLUS is available for $379. 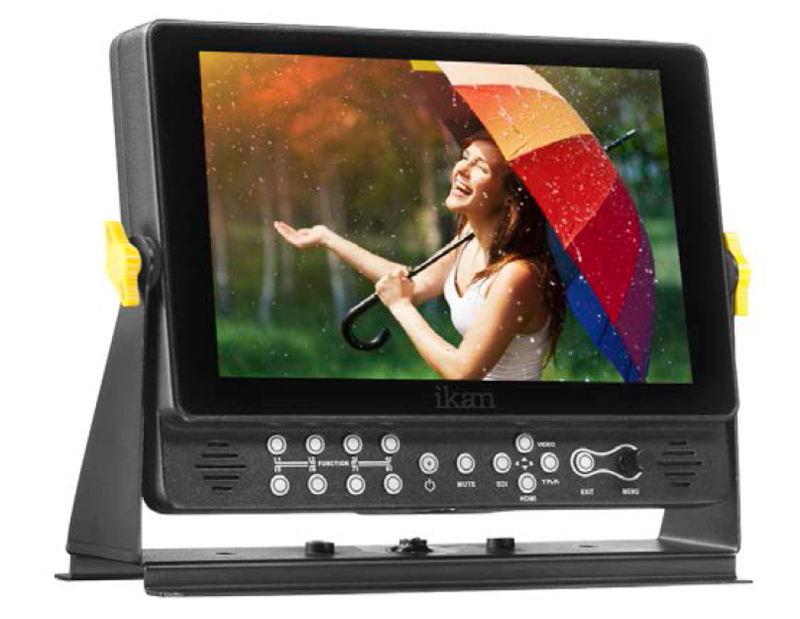 Debuting at NAB 2015 will be Ikan’s newest production monitor, the 8.9 inch VX9i, featuring dazzling imagery generated by an IPS LCD panel with 1920×1200 resolution. The monitor is also configured with waveform as the VX9w. Tilta Technology will also be at the Ikan booth to show their cage systems for the Sony FS7 and a7S. They’ll also be introducing the TMax follow focus and their wearable “Armor Man” stabilizer/gimbal system. You can find out more about Ikan’s NAB lineup in the press release below, as well as by visiting Ikan in booth C6537 at this year’s NAB show. Not attending this show this year? Be sure to stay tuned to HDSLR Shooter for coverage of this year’s show in April. Ikan Corp presents new production equipment and solutions for film/video makers at all levels. HOUSTON, Texas, (Mar. 18, 2015) — Ikan International Corp will be displaying a full spectrum of equipment solutions for motion picture and broadcast production at the 2015 NAB Show. From prosumer to ENG to pro cinema, it’s likely that users of all stripes will discover a production solution that suits their needs this year at the Ikan showcase. At the annual industry confab held at the Las Vegas Convention Center April 13-16, Ikan will present a 50 x 50-foot booth — its largest ever — with an array of equipment pods that span the continuum of user segments. The “Just Add Camera” vignettes will feature production setups custom-designed for corporate and institutional venues, budget and high-end studios, news gathering, documentaries, indie film, and new media. With help from a full complement of knowledgeable Ikan staffers, NAB attendees have the opportunity to get ‘up-close and hands-on’ with all the products. The Ikan booth is located in the Central Hall, number C6537. Making its debut at NAB 2015 will be Ikan’s newest production monitor, the 8.9 inch VX9i, featuring dazzling imagery generated by an IPS LCD panel with 1920×1200 resolution. The monitor is also configured with waveform as the VX9w. Other new products on demo include Ikan’s Piatto Lights, LED Ring Light, White Star Fresnels, the very popular Fly-X3-PLUS handheld gimbal stabilizer for Smartphones and GoPro cameras, the lightweight and flexible ELE-ENG shoulder rig support system, five new teleprompters designed for use in the field and small studios, and more. Joining Ikan in its booth this year will be representatives of Tilta Technology, maker of the popular camera rigs and cage systems for which Ikan is the exclusive North American distributor. In addition to showing its “armed” cage systems for the Sony FS7 and a7S cameras, Tilta will introduce the TMax line, which includes its new wireless follow-focus, EVF (electronic view finder) and “Armor Man,” a remarkable gimbal stabilizer system worn by the camera operator.